A simple and cheap device to diagnose sleeping sickness is a step closer according to scientists in Sweden. Human African trypanosomiasis, or sleeping sickness, is caused by parasites in the blood called trypanosomes. The disease is transmitted by tsetse flies and is fatal is left untreated. Standard diagnosis is done by looking for the parasites in blood samples using a microscope. However, the concentration of parasites is often very low, so they need to be separated from the red blood cells before analysis. Many separation methods have been developed, but they are expensive and too complex to use in remote areas where the disease is common. 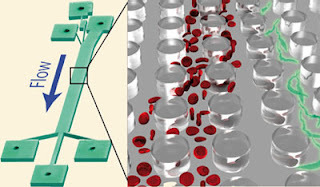 Jonas Tegenfeldt from the University of Lund, and his colleagues, have developed a microfluidic device that separates the parasites from the blood cells using their shape, because parasites and red blood cells are very difficult to separate by size. Tegenfeldt and his team 'attacked the problem of separating parasite from blood by first determining a robust difference in intrinsic properties between trypanosomes and red blood cells, namely shape, and then they figured out how to adapt a nominally size-dependent separation device into one that can separate by shape,' explains Joel Voldman, an expert in microtechnology at the Massachussetts Institute of Technology, US. The researchers modified and tailored the depth of microfluidic devices known to separate particles according to size, making them able to discriminate particles by shape instead. In conventional size-separating devices, the particles flow through an array of posts that create narrow streams of different sizes. The particles that are too big to go through the smaller streams are filtered to bigger streams. The problem comes when trying to separate non-spherical particles (like parasites), as these can show different sizes depending on their orientation. Building these devices with a shallow depth (tailored to the size of the parasites), forces the particles to adopt a fixed orientation as they cannot rotate freely in the fluid, accentuating their different morphologies. 'The change in the device is minor, but it comes about through understanding the physics of separation,' adds Voldman. The principle, says Tegenfeldt, could be applied to other diseases. He adds that 'there are many other neglected diseases identified by, for example, the Bill and Melinda Gates Foundation, in which simple microfluidics may make a difference'.